I mentioned in the very first post of this blog that I often bring vegetarian/vegan dishes to potlucks so that more people can enjoy it. But it’s not just potlucks; Jarod and I both eat meat, but I make a conscious choice to cook less of it than I used to. Eating mostly vegetarian is cheaper, it has a smaller impact on the environment, and it helps me make sure I’m getting all kinds of delicious vegetables into my body. At the same time, though, I need a good amount of protein to keep my body chemistry in line. And while I do love beans, sometimes I just want something… meatier. That isn’t meat. (Work with me here.) Tofu and tempeh are nice, but they take way more time and effort to make from scratch (as in from raw soybeans), and once you’re buying the commercial product the cost savings go away. So what’s a sometimes-vegetarian to do? Seitan — I say SAY-tahn, but people don’t really agree on pronunciation — is amazing. It’s a lean, firm protein that holds up to rough treatment and can take on many flavors, and it’s made almost entirely of wheat. Essentially, it’s flavored wheat gluten: bread without, you know, bread. (So, I guess I should revise that earlier sentence to “Seitan is amazing for people who aren’t eating gluten-free.”) In fact, that’s how it was originally made in China and Japan: the cook would make a basic wheat dough of flour and water, then wash the dough ball in many changes of water until all the starch had run out and only the gluten remained: that gluten ball was the raw seitan, which would be boiled or steamed to make the final product. You can still make it that way, of course, but there’s a very handy shortcut that also enables you to flavor it. Vital wheat gluten flour is a magical product that simplifies the whole process: it’s wheat flour that’s already had the starch removed, which makes it, effectively, instant seitan powder. You can definitely find it in specialty and health-food stores, but I’ve seen it even in regular groceries, especially since many groceries are starting to include bulk sections. You can also, of course, buy it online. The same goes for the other ‘weird’ ingredient in this seitan, nutritional yeast. Nutritional yeast (or ‘nooch’, if you’re feeling hip) is related to the yeast used in baking and brewing, but they’re not interchangeable. Nooch comes in small yellow flakes, instead of the beige granules of baker’s yeast. It has a rich, nutty flavor that makes it a common ingredient in cheese substitutes (it’s also a great popcorn topping), and in this recipe it gives a savory richness to the seitan, as well as even more protein. Combined with a few other basic seasonings, you end up with a tasty, inexpensive* protein that can be used almost anywhere you’d use chunks or slices of meat, and it comes together using shelf-stable dry goods and pantry staples in just 15 minutes (plus an hour to simmer, but you can go do something else while that’s happening). *Obviously this will vary with the exact products you buy, but last time I bought vital wheat gluten flour is was about $5/pound. This recipe uses a little less than 10 oz. of VWGF, so let’s call that $3. 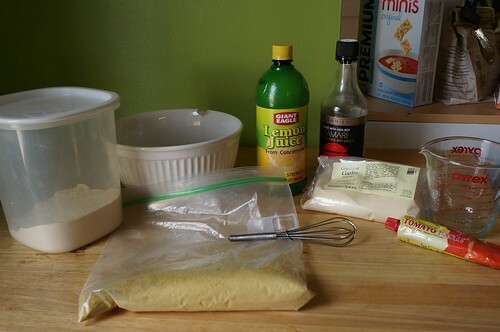 Nutritional yeast costs about $5-$7 per package, but per recipe is all but free. Soy sauce is the only other major cost-incurring ingredient; let’s say that your sauce is alarmingly expensive, at $5 for an 8 oz. bottle, of which you’ll use half: $2.50. So for two pounds of seitan you’re out $5.50, or $2.25/pound. Again, this depends on exactly what you buy, but I can’t generally come up with high-quality beef for $2.25/pound. 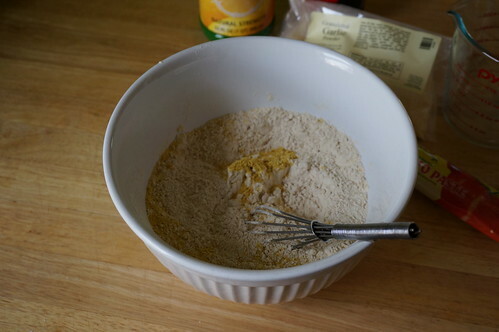 In a large bowl stir together the vital wheat gluten flour and nutritional yeast. 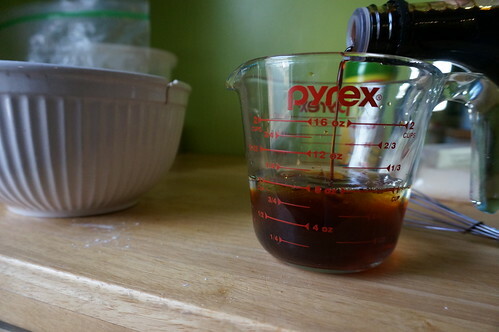 In a small bowl or measuring cup, combine the remaining ingredients. Add the wet mixture to the vital wheat gluten flour mixture and stir until combined. Knead briefly until very firm. 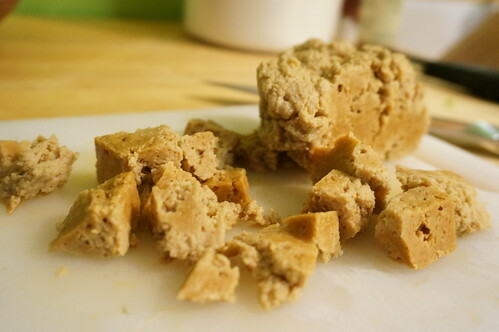 Cut seitan dough into 3 chunks and add to a pot of cold water — enough water that the chunks are completely covered — along with the soy sauce/bouillon cubes/salt. Bring to a bare simmer and simmer partially covered 1 hour. Allow to cool in simmering liquid. Can be used immediately, or stored in its simmering liquid in the fridge. This is pretty foolproof, but there are two things that will do strange things to the texture: too much liquid and too much heat. Both will make the seitan weirdly spongy. So start in cold water when possible, and keep the simmer low — absolutely no boiling. 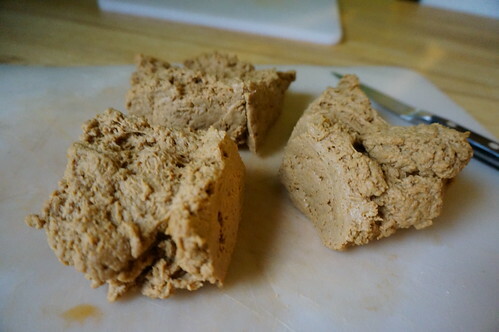 And when you’re mixing it up, if you think the seitan looks a little dry add water only very sparingly. And a note on salt: I know, this sounds like a lot of salt. However, a good deal of it goes out into the cooking liquid during the simmering process. In fact, that’s the reason for adding some saltiness to the cooking water itself: to make the salt concentrations less unequal so that less salt diffuses out. Science! Anyway, this doesn’t taste overly salty to my palate in a finished dish, but you can adjust in the next batch if your taste buds disagree. You can use fresh ingredients for the lemon and garlic — finely grated zest of one lemon and one grated/pressed garlic clove, respectively — but I wrote this with the most shelf-stable ingredients possible. In the same use-what-you’ve-got-vein, you can sub ketchup for the tomato paste without any noticeable difference. As written, this gives a fairly neutral flavor profile, rich and a little salty. You can change it up, though: as long as the amount of liquid remains approximately the same and there’s a good amount of saltiness in the mix (so it doesn’t come out terribly bland), the flavorings can be changed wildly: give it a try!